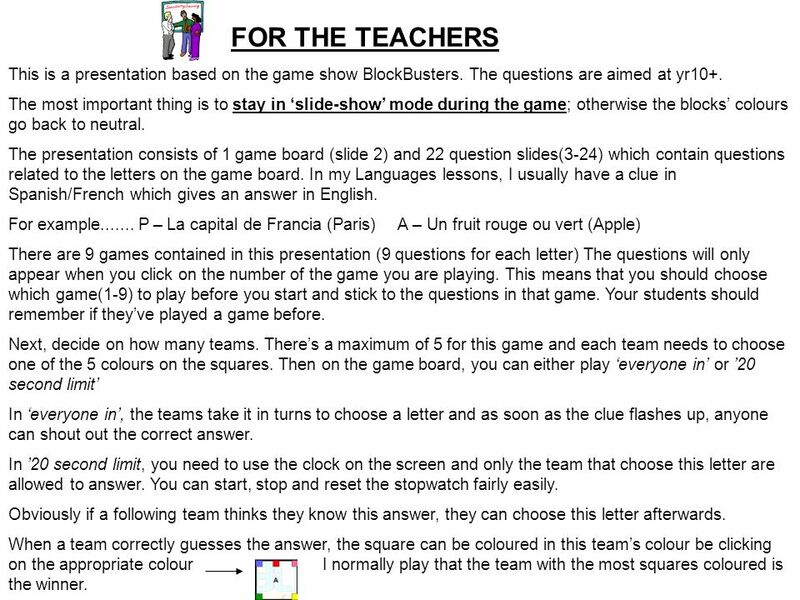 1 FOR THE TEACHERS This is a presentation based on the game show BlockBusters. The questions are aimed at yr10+. The most important thing is to stay in ‘slide-show’ mode during the game; otherwise the blocks’ colours go back to neutral. 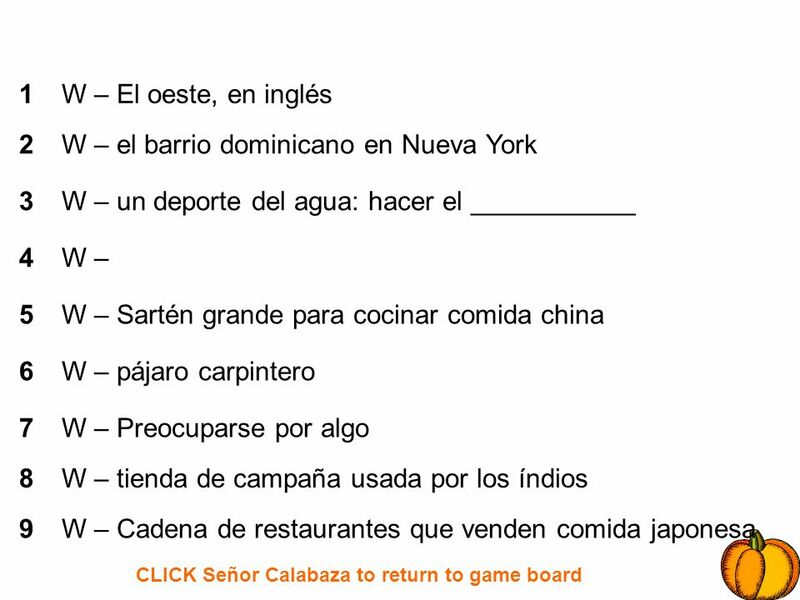 The presentation consists of 1 game board (slide 2) and 22 question slides(3-24) which contain questions related to the letters on the game board. 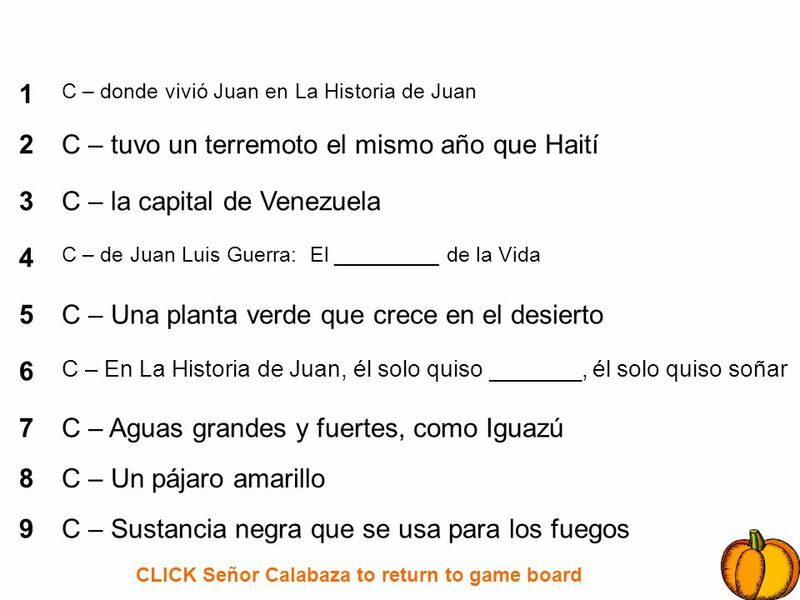 In my Languages lessons, I usually have a clue in Spanish/French which gives an answer in English. 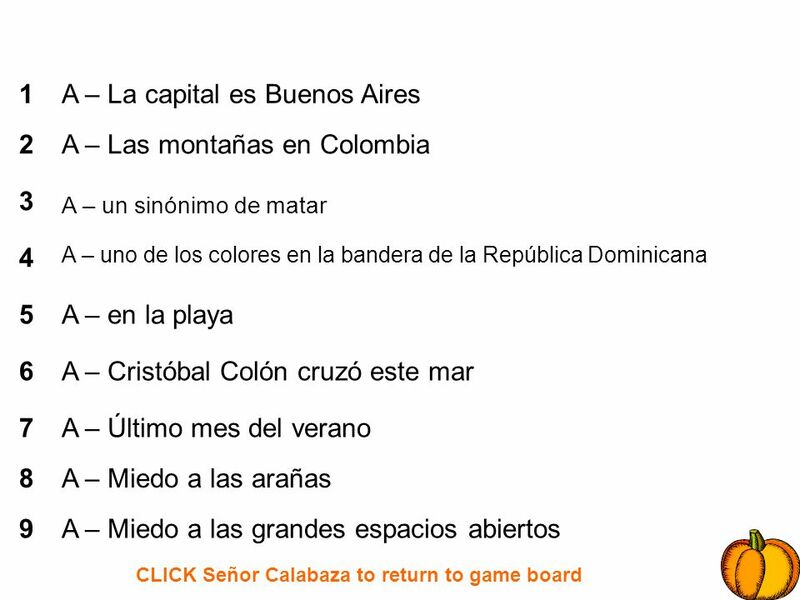 For example P – La capital de Francia (Paris) A – Un fruit rouge ou vert (Apple) There are 9 games contained in this presentation (9 questions for each letter) The questions will only appear when you click on the number of the game you are playing. This means that you should choose which game(1-9) to play before you start and stick to the questions in that game. Your students should remember if they’ve played a game before. Next, decide on how many teams. There’s a maximum of 5 for this game and each team needs to choose one of the 5 colours on the squares. Then on the game board, you can either play ‘everyone in’ or ’20 second limit’ In ‘everyone in’, the teams take it in turns to choose a letter and as soon as the clue flashes up, anyone can shout out the correct answer. In ’20 second limit, you need to use the clock on the screen and only the team that choose this letter are allowed to answer. You can start, stop and reset the stopwatch fairly easily. 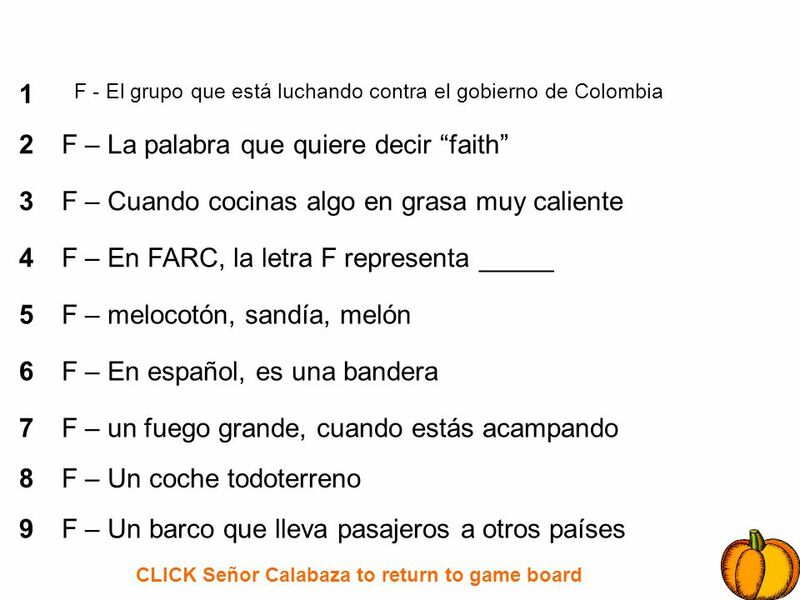 Obviously if a following team thinks they know this answer, they can choose this letter afterwards. 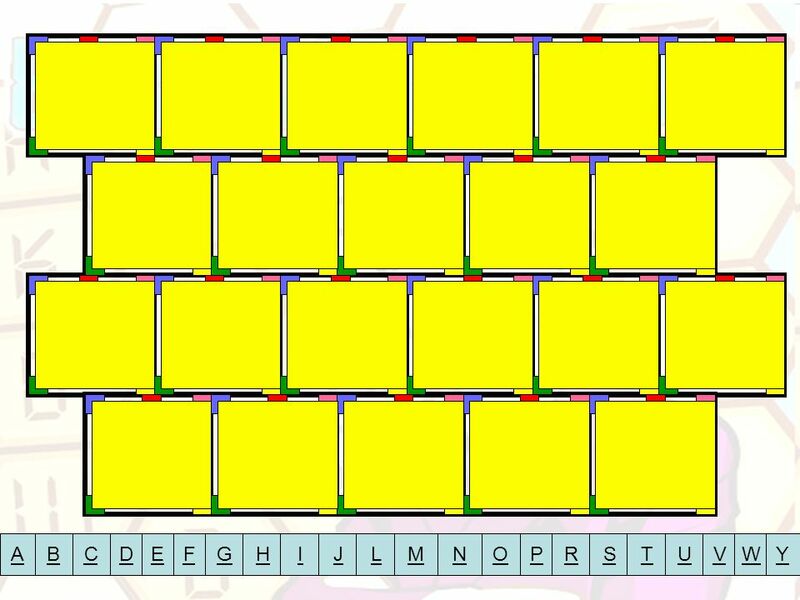 When a team correctly guesses the answer, the square can be coloured in this team’s colour be clicking on the appropriate colour I normally play that the team with the most squares coloured is the winner. 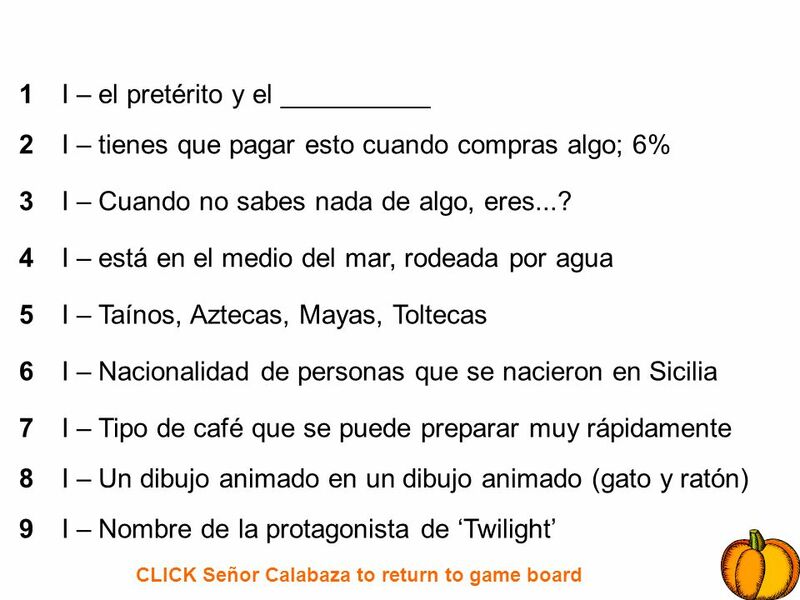 Descargar ppt "FOR THE TEACHERS This is a presentation based on the game show BlockBusters. The questions are aimed at yr10+. 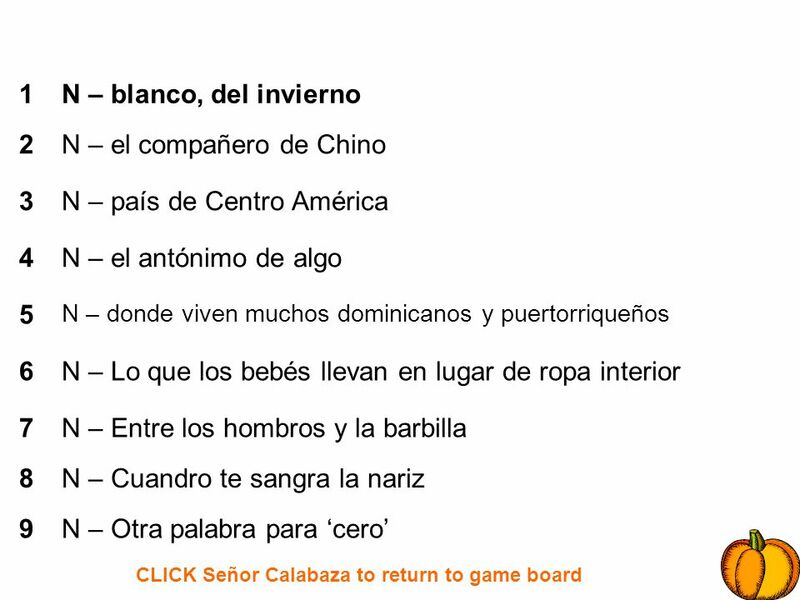 The most important thing is to stay in ‘slide-show’"
Hoy es viernes, el 8 de noviembre La pregunta: Read the conexiones box on p. 20 en el libro de texto. When it is winter in the Northern Hemisphere, what. 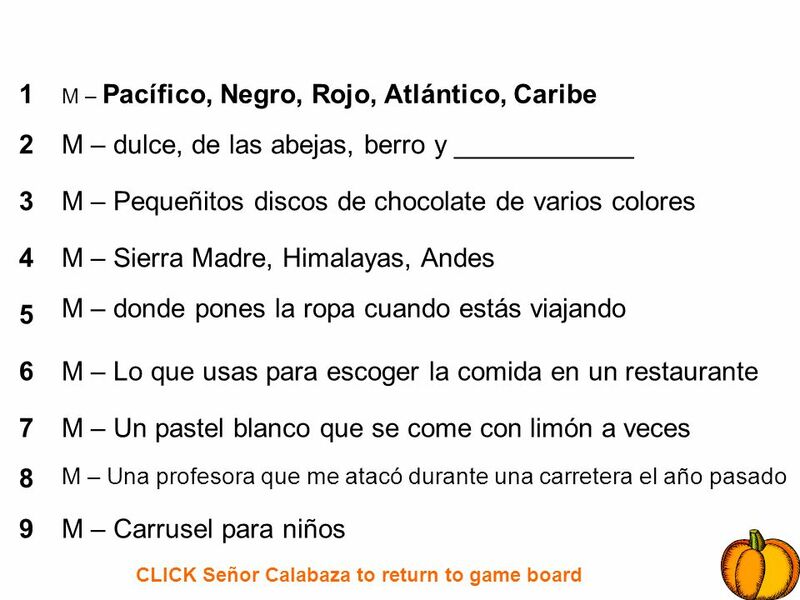 Español 1 Tema 7a Página 342. 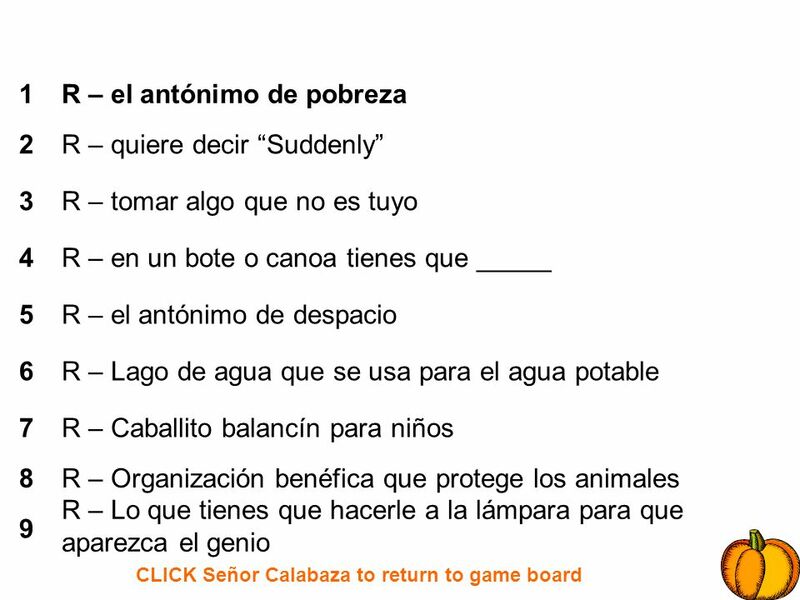 Cápitulo 7A Vocabulario. Las Preguntas (the questions) Tengo una pregunta … Carlos estudia en la biblioteca. s vo Forming YES and NO questions is easy. 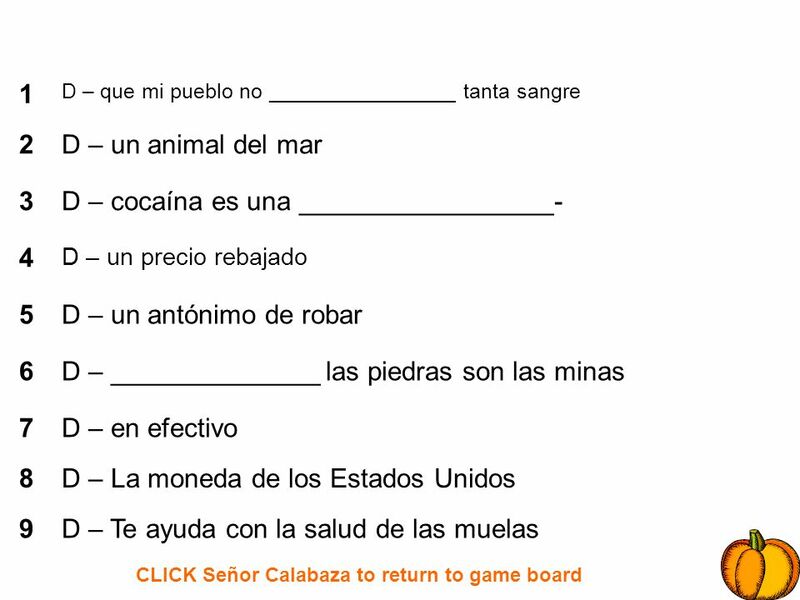 In Spanish, reverse the. 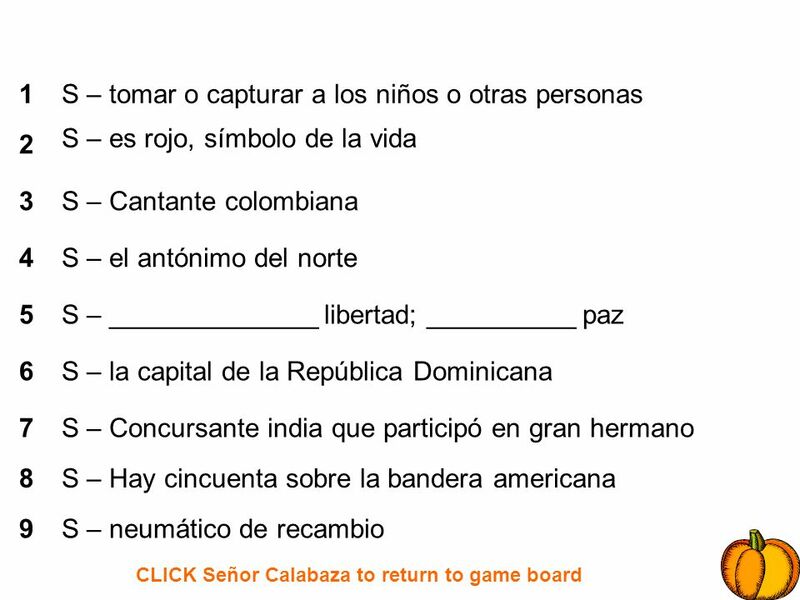 ALC 19 Jueves el 13 de octubre Bienvenida-ALC-objetivo Columbus quiz Lectura Body parts practice Monstruo. 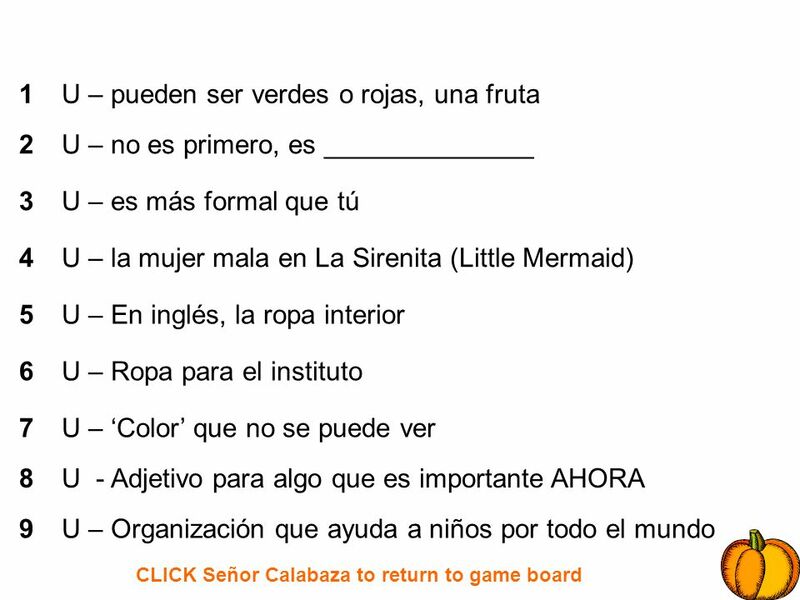 Horario 19 viernes el 14 de octubre Bienvenida-ALC-objetivo Speed date Flash cards of top verbs – word search. 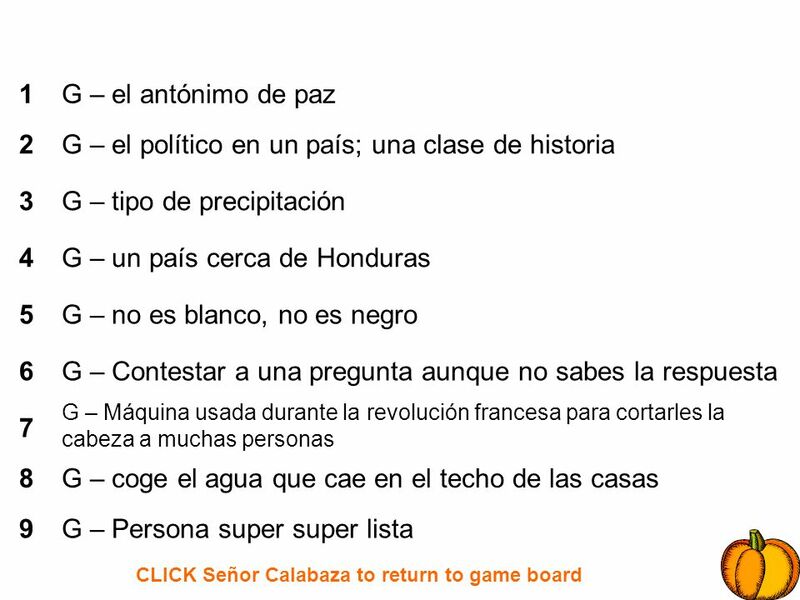 Dr. Frankenpiedra Top 25 + irregular verb. ALC 74 Hoy es miércoles el 18 de abril de Llena los espacios o escribe todo. ______ ____ ____ ________ grande ______donde ____________grande ________.